LONDON -- As Prime Minister Theresa May prepared her next move in Britain's deadlocked Brexit battle, a senior opposition politician said Sunday that it's unlikely the U.K. will leave the European Union as scheduled on March 29. A government minister, however, warned that failure to deliver on Brexit would betray voters and unleash a "political tsunami." 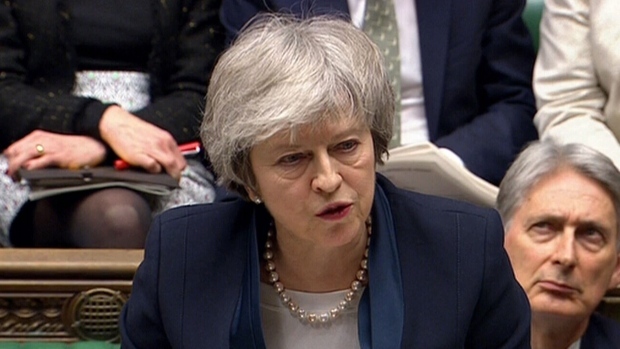 May is due to present Parliament with a revised Brexit plan on Monday, after the divorce deal she had struck the EU was rejected by lawmakers last week. With just over two months until Britain is due to leave the bloc, some members of Parliament are pushing for the U.K. to delay its departure until the country's divided politicians can agree on a way forward. Labour Party Brexit spokesman Keir Starmer said "it's inevitable" Britain will have to ask the EU to extend the two-year countdown to exit that ends on March 29. Britain's political impasse over Brexit is fueling concerns that the country may crash out of the EU on March 29 with no agreement in place to cushion the shock. That could see tariffs imposed on goods moving between Britain and the EU, sparking logjams at ports and shortages of essential supplies. Many economists expect Britain to plunge into recession if there is a "no-deal" Brexit. May's government is split between ministers who think a disorderly departure must be avoided at all costs, and Brexit-backers who believe it would be preferable to delaying or reversing Brexit. May has spent the days since her deal was thrown out meeting government and opposition lawmakers in an attempt to find a compromise. But the talks have produced few signs that May plans to make radical changes to her deal, or to lift her insistence that Brexit means leaving the EU's single market and customs union. Fox said one possible solution could be to strike a deal with the Irish government guaranteeing there would be no border controls between EU member Ireland and the U.K.'s Northern Ireland. He said that could ease concerns about the deal's most contentious measure -- an insurance policy known as the "backstop" that would keep Britain in an EU customs union to maintain an open Irish border after Brexit. Pro-Brexit lawmakers worry that Britain could be trapped indefinitely in the arrangement, bound to EU trade rules and unable to strike new deals around the world. Irish Foreign Minister Simon Coveney, however, tweeted that the Irish government was committed to the entire withdrawal deal, "including the backstop." British lawmakers who want a softer Brexit are preparing to try to amend May's plans in a Jan. 29 debate, and to use parliamentary rules to try to prevent a no-deal Brexit and take control of the exit process. Conservative lawmaker Nicky Morgan said she and several opposition colleagues planned to introduce a bill to ensure "that if the prime minister can't get an agreement approved by the House of Commons by the end of February," the U.K. will ask the EU to postpone its departure date "so that we can build a consensus and get ourselves more prepared for Brexit. " Delaying Brexit would require approval from the 27 other EU nations. Starmer said there was a roadblock in the way of a solution to the Brexit crisis, "and that roadblock is the prime minister."